There are Mysteries and Secrets contained in these pages, all of them related to the Divine Imprint already present in the reader's Heart. This book is dedicated to the carefree, joyful, triumphant Child within each of us. The Child Within us Lives! 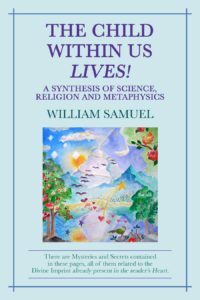 charts a practical and livable course through the labyrinth of the objective sciences and religions into the mysterious states of the new sciences and metaphysics... and, further, we are taken to the transcendence of such divisions in the discovery of our original nature, the Child within. Here is a working and proven metaphysics that does not decry the reality of matter, but insists that matter be understood as part of one's self-discovery in process. Samuel speaks to the primal nature of light and linear time and to the necessity of understanding them. Those on the path of self-discovery will appreciate this well written work that is filled with clarifying analogies that relate to transcending dualism and understanding the reason for this human experience. Many of the prophets have spoken of a mysterious Child and childlikeness to prevail in the end days of linear time -- This book is about that Child, the Unobstructed Spirit and the grand view which includes the rediscovery of simple subjectivism, a new mark in non-space, non-time, and the fulfillment of the Original Purpose for tangible life on earth.